WASHINGTON -- President Donald Trump will revive a program that provides local police departments with surplus military equipment such as high-caliber weapons and grenade launchers, despite past concerns that armored vehicles and other gear were inflaming confrontations with protesters. Attorney General Jeff Sessions announced the program to roaring applause Monday at a national convention of the Fraternal Order of Police, one of the groups that had long urged Trump to restore the military program. The plan will "ensure that you can get the lifesaving gear that you need to do your job and send a strong message that we will not allow criminal activity, violence, and lawlessness to become a new normal," Sessions told the cheering crowd. Trump plans to sign an order undoing Obama-era limitations on police agencies' access to camouflage uniforms, bullet-proof vests, riot shields, firearms, ammunition and other items. The changes are another way in which Trump and Sessions are enacting a law-and-order agenda that federal support of local police as key to driving down violent crime. Groups across the political spectrum have expressed concern about the militarization of police, arguing that the equipment encourages and escalates confrontations with officers. But many law enforcement agencies and policing organizations see it as needed to ensure officers aren't put in danger when responding to active shooter calls and terrorist attacks. An armored vehicle played a key role in the police response to the December 2015 mass shooting in San Bernardino, California. Congress authorized the Pentagon program in 1990, allowing police to receive surplus equipment to help fight drugs, which then gave way to the fight against terrorism. President Barack Obama issued an executive order in 2015 that severely limited the program, partly triggered by public outrage over the use of military gear during protests in Ferguson, Missouri, following the shooting death of 18-year-old Michael Brown. Police responded in riot gear and deployed tear gas, dogs and armored vehicles. At times they also pointed assault rifles at protesters. Obama's order prohibited the federal government from providing grenade launchers, bayonets, tracked armored vehicles, weaponized aircraft and vehicles, and firearms and ammunition of .50-caliber or greater to police. "Those restrictions went too far," Sessions said. "We will not put superficial concerns above public safety." As of December, the agency overseeing the program had recalled at least 100 grenade launchers, more than 1,600 bayonets and 126 tracked vehicles - those that run on continuous, tank-like tracks instead of wheels - that were provided through the program. Trump vowed to rescind the executive order in a written response to a Fraternal Order of Police questionnaire that helped him win an endorsement from the organization of rank-and-file officers. He reiterated his promise during a gathering of police officers in July, saying the equipment still on the streets is being put to good use. "In fact, that stuff is disappearing so fast we have none left," Trump said. The NAACP Legal Defense Fund said in a statement Sunday night that it is "exceptionally dangerous and irresponsible" for the administration to lift the ban. 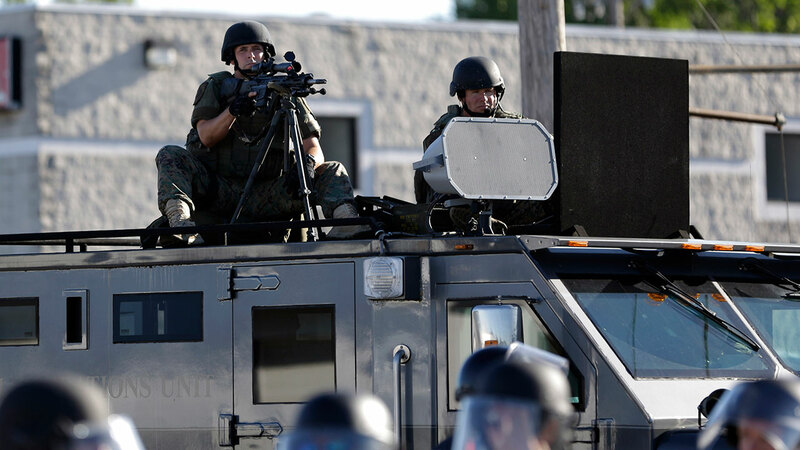 "Just a few summers ago, our nation watched as Ferguson raised the specter of increased police militarization. The law enforcement response there and in too many places across the country demonstrated how perilous, especially for Black and Brown communities, a militarized police force can be," the LDF said. "The President's decision to make this change in the wake of the tragedy in Charlottesville and against a backdrop of frayed relations between police and communities of color further reflects this administration's now open effort to escalate racial tensions in our country," the organization said. Justice Department documents summarizing the order describe much of the gear as "defensive in nature," intended to protect officers from danger. Most police agencies rarely require military equipment for daily use but see a need to have it available, said Chuck Wexler, executive director of the Police Executive Research Forum. "It is hard to imagine any situation where a grenade launcher or bayonet would be something that a major police department would need, but defensive shields and armored vehicles kept on reserve will be welcome," he said. Sessions has said he believes boosting morale among police can help curb spikes in violence in some cities. The plan to restore access to military equipment comes after Sessions has said he intends to pull back on court-enforceable improvement plans with troubled police departments, which he says can malign entire agencies and make officers less aggressive on the street.